Mosaic klipfish variations, photographed in their rubble-bottom environment. All photos Guido Zsilavecz. 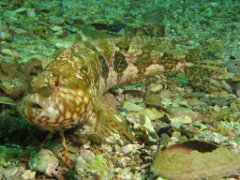 This species was discovered by SURG co-founder Guido Zsilavecz during an investigation into the "super-klipfish" complex, led by Wouter Holleman and together with Dr. Sophie v.d. Heyden. 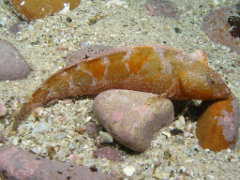 Super klipfish (Clinus superciliosus) is one of the most wide-spread and common of species of southern-African klipfish, and the first one described from southern African waters. Over time a number of species similar to C. superciliosus have been described, but their validity of species has been debated over time as well, with some scientists lumping them together, others separating them again. The last in-depth review by ML Penrith, in 1969, lumped them together. In this group were three species: Clinus superciliosus, Clinus arborescens and Clinus ornatus. Wouter Holleman, together with Dr. v.d. Heyden and Guido Zsilavecz, decided to investigate in depth to see if this grouping was valid, or whether the original separation into individual species was correct. Using DNA, rather than just morphological features, it was established that they were indeed distinct species. 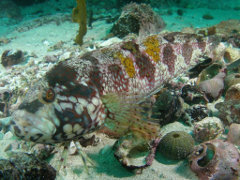 It was during this investigation that the mosaic klipfish was identified as being another distinct species, even if closely related to the Super klipfish. 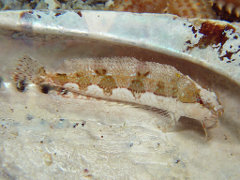 Guido had photographed the mosaic klipfish before, and virtually always found it in a certain environment (rubble bottoms), and with distinct, and usually consistently markings. Initially he thought this might be C. ornatus. 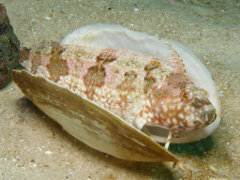 He had photographed this species as well, but was never quite convinced that this fish, with its sail-like dorsal crest and much more rounded facial profile, was the same as the mosaic klipfish, although they share a similar body pattern. After a few specimens were collected and compared, the conclusion was that this was indeed a different species,and named "musaicus" at Guido's request, due to the pattern on its body resembling a mosaic. During the same investigation another species was identified, from a single specimen, caught by Dr. v.d. Heyden, and named C. exasperatus, simply because after extensive searching no other specimen has been found since. 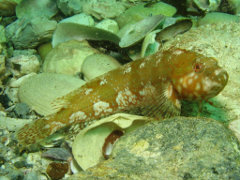 Apart from C. superciliosus, Clinus arborescens (which does not seem to occur in Cape Town waters) and Clinus ornatus, and now C. musaicus and C. exasperatus, the Superciliosus complex also contains C. spatulatus, an estuarine species. The findings were published in the Linnean Society Zoological Journal. Delineating the fishes of the Clinus superciliosus species complex in southern African waters (Blennioidei: Clinidae: Clinini), with the validation of Clinus arborescens Gilchrist & Thompson, 1908 and Clinus ornatus Gilchrist & Thompson, 1908, and with the description of two new species, W Holleman, S von der Heyden and G Zsilavecz, The linnean Society of London, Zoological Journal of the Linnean Society, 2012, 166, 827-853. Two Oceans, A guide to the marine life of Southern Africa, GM Branch, CL Griffiths, ML Branch and LE Beckley, 1994.